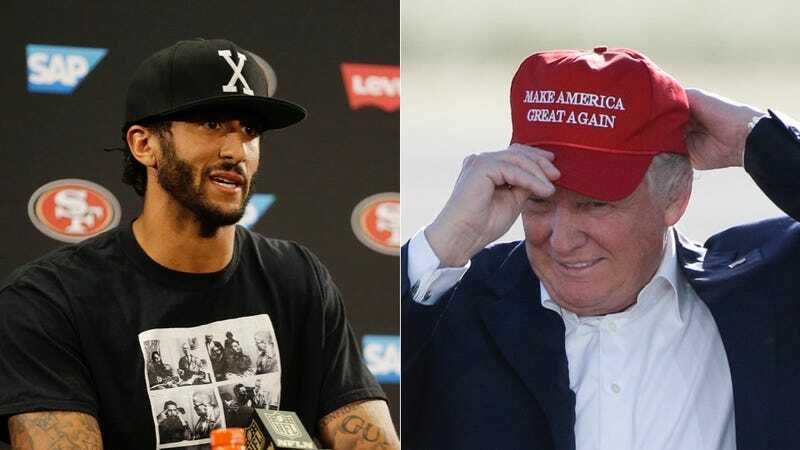 Donald Trump On Colin Kaepernick: "Maybe He Should Find A Country That Works Better For Him"
What you are about to hear represents an utterly monumental lack of self-awareness on Donald Trump’s part—astonishing, I know. Trump’s entire campaign is based around the idea that America is stumbling, or broken, or fundamentally subpar in some way—“Make America great again” and all that. His response to someone else who believes America needs to fix things is to tell him to look for another country. Incredible. I’m reminded that “if you don’t like it, get out” was a common rejoinder to political protests of the Bush era—as if America were perfect, and supporting it means never acknowledging its faults, and if you want to call attention to its shortcomings and work to make it better, you must not truly love it. That refrain seemed to have thankfully disappeared from top-level political discourse. God bless Donald Trump for never failing to disappoint with the takes.